Hi Craig-I borrowed your photo from Yachtworld to show how good Lewina ex ML1305 is looking nowadays. You beat me to it, spotted the picture this morning. She looks very lean and fit for purpose, I hope that she finds a loving home. Where is she berthed please? Also can you plese send me some more pics. I have pm-ed my email address. 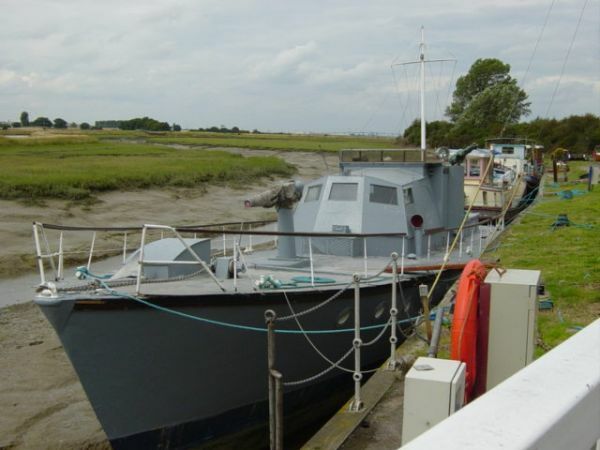 Click on 'Houseboats' and look down the list to £35,000 and "Historic wartime motor patrol launch" about 20 photos there. I'm just glad I didn't read the advert properly and realise the price! She looks really interesting. Good luck if you go to view her. Just seen the posts about the above, well, very interesting, would be nice to see her and Medusa running together perhaps, ah, not wanting to be a damp squid but..see claims on the brokerage site about national lottery funding and free berthing at national ports, well, have experience of the lottery and as far as I know, you would at the least need to be a registred charity and not a privately owned vessel, not heard of this free berthing, would be nice if true. But any way, would still be nice if someone could take her on, can't offer free berthing but if coming by Chatham Marina, give a call, would be nice to see her. Just been onto the Historic Ships site, thought I saw her some years ago, and she had a radically different top side ie as a cruiser, but can see the current owner since 1999 has turned her back to origional look, well done, she dose look so much better. As one of only six left I have no doubt she deserves to be kept as is, and hopefully run around and shown off, nice to see her in company with Medusa one day perhaps, she of course has had a one million grant ex the lottery for a complete re-furb, not saying money could not be available for Lewina, we at the Medway Queen have managed to get a grant after Waverly and Kingswear Castle paddlers have had money,but as I said, I don't think it would come to a private vessel, would be like getting money to do up your own car or house, however I have a vague idea that has happend with some person in the art world got money for thier house, though there might have been restrictions on what they could do with it in terms of selling it may by. Any way, all very interesting, watching with interest. There's at least 38 HDMLs still surviving, see the survivors section of the HMS Medusa website they are all listed there (not to say that this in any way reduces Lewinas historical value, she does indeed look very good as she is now). Where did you come by the figure of 6? I think the figure of 6 comes from the Historic ships Reister. That claims her to be "one of 6 in the world out of 280 worldwide." I think it must be a typo for one of 6 in the Country!! Thanks for clearing that up, you must be right. The total number built was closer to 480 though, although again perhaps 280 were UK built, I haven't checked this.